Are you able to dump the original firmware? Ultimately there are two hardware hacks I’d like to see on this thing: 1) Ability to use a wired network connection. 2) Separate audio output, preferably optical (TOLSINK). Can you please link me to a usb powered cable, also is it micro usb or mini usb cable? Would it be possible to package the Chromecast functionality as an Android app? 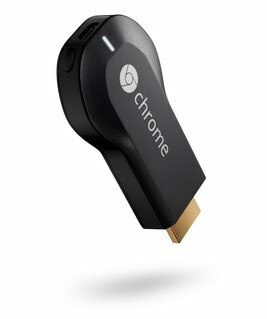 Would be cool for people in countries that do not have access to the Chromecast yet (and have a spare Android device with MHL or other HDMI connection laying around). Is it possible to install the Chromecast image to Logitech Revue? How did you get the CLI interface on the left monitor of the device? I saw on the wiki about the UART but it states that only logs the boot process. I saw typing on the CLI. How was that accomplished?